Potts Point Café is definitely one of those places that I know I can always have a satisfying meal at anytime of the day. 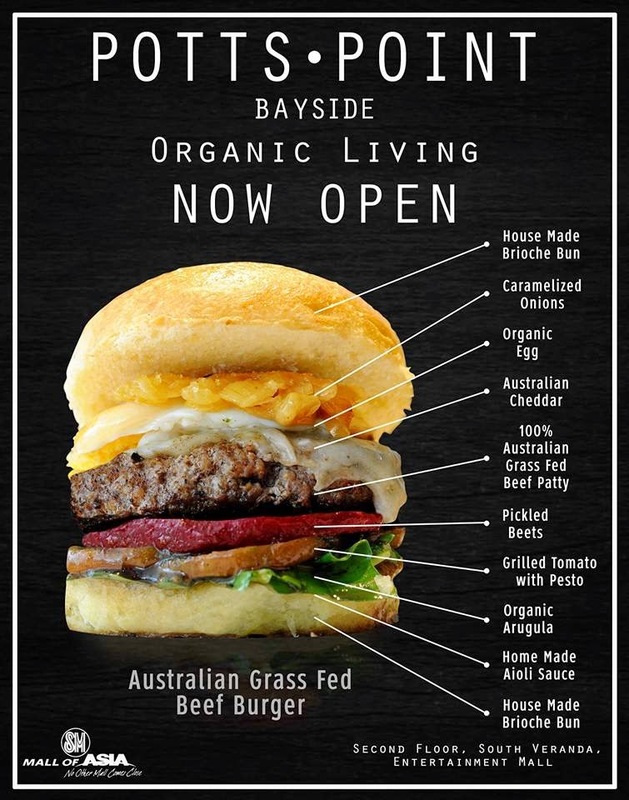 I was invited at the grand opening of Potts Point Café Bayside MOA last April 11th and I got to experience the Australian organic offerings the café has to offer. The degustion started with a soup serving. I find Cream of Organic Cauliflower Soup with Truffle Foam (P 180) to be bland. The cauliflower made it a little sweeter with a hint of truffle coming from its truffle foam. I like the Shakshuka (organic eggs poached in tomato sauce at P 265). This Middle Eastern, egg-rich dish laden with organic pork sausage and served with toasted baguette slices was very satisfying. Thai Chopped Salad With Grilled Chicken, Crispy Wonton and Pomelo (P 245) is a simple salad that I found to be nice. The crunchy pomelo pulp goes well with the crispy-fried wonton and Thai flavorings. Australian Grass-fed All Beef Burger with Australian Cheddar, Pickled Beets, Olive Oil Aioli and House-made Brioche Bun with Baked Sweet Potato Wedges (with Egg) looks like an ordinary burger but the fact that it is all organic makes it extra special! The superb patty comes from grass-fed cattle and the cheese is no less than the Australian Cheddar. The baked sweet potato wedges compliment the juicy taste of the burger. You should add this to your must-try list! The Roast Australian Lamb with Bone Marrow Rice and Demiglace (P 595) is another must-try dish at Potts Point Café. The tender meat has a rich flavor that makes it worth waiting for. Salmon Linguine with Capers in Dill Cream Sauce (P 365) is a terrific, healthy dish that you must also try. The Melange of Seafood Provencale with Brown Rice Risotto (P 395) is Potts Point Café's flavorful take on seafood. This a plateful of goodness you shouldn't miss out on. The Delano coffee and other hot/cold coffee concoctions are also available from this Aussie café. Do check them out soon. It's a different take on salad that you shouldn't miss out. Try it sometime. It's nice that some restaurants invites blogger. I hope someone would invite me too. I'm not familiar with the foods though. Then I realized it's located in the Philippines pala. My-my...those foods are mouth watering. The hamburger with fried egg looks yummy too. I highly recommend their hamburger. everything looks delish + i would love to try the burger, as well as the seafood with risotto. i hope i can visit this place with my boys soon! Jared would love the hamburger for sure.